Heat oven to 375°F. In large bowl, dissolve coffee powder in hot water. Stir in cookie mix, flour, butter, vanilla and egg until very soft dough forms. Shape dough into 1 1/2-inch balls. On ungreased baking sheets, place balls 2 inches apart. Using thumb or handle of wooden spoon, make indentation in centre of each cookie. Bake 8 to 10 minutes or until edges are light golden brown. Cool 2 minutes; remove from baking sheets to cooling racks. In small microwavable bowl, microwave caramels and milk uncovered on High 1 minute to 1 minute 30 seconds, stirring once, until caramels are melted. 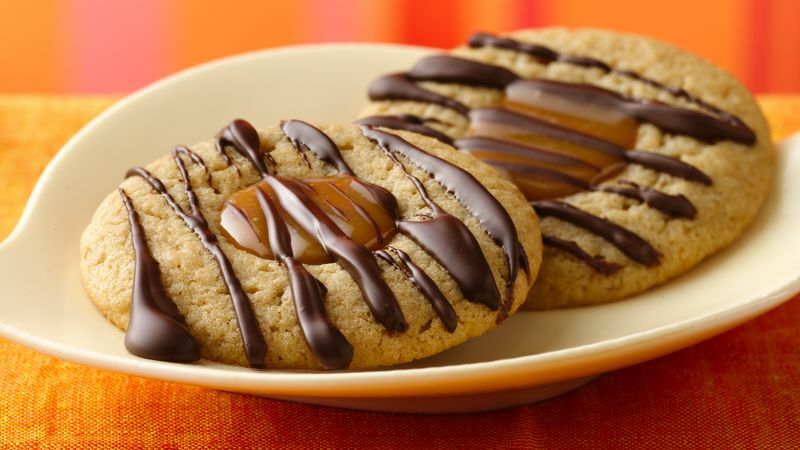 Spoon 1/2 teaspoon caramel into indentation in each cookie. Cool 15 minutes. In another small microwavable bowl, microwave chocolate chips and shortening uncovered on High 1 minute to 1 minute 30 seconds or until chips can be stirred smooth. Drizzle chocolate over cookies. Let stand about 30 minutes or until chocolate is set. Winner's Quote "Cookies are my thing. The thumbprints are fragrant with espresso and vanilla, filled with creamy caramel and a drizzle of chocolate...heavenly!" Success Chilll dough for about 20 minutes to make it easier to shape. How-To To drizzle chocolate easily, spoon melted chocolate into small resealable food-storage plastic bag; cut small tip from 1 bottom corner. Squeeze bag gently to drizzle chocolate over cookies.